Being part of the growth endeavor of a brand such as, William Grant & Sons was an exciting prospect for the studio. The brief was in-sync with their company values of pride, responsibility, professionalism, entrepreneurship, long term, sustainability. These values were not necessarily imbibed as metaphors but were also prevalent in an objective requirement – of several small meeting rooms, semi-formal discussion zones, well-lit interiors, a possible gathering of 70+ people for a town hall, proverbial open office; essentially a lively and happy working environment. The primary materials were borrowed from a distillery dispatch. The Hardwood batons and MS flats (bent & configured as required) not only make a symbolic connection but also add warmth. Both the zones have distinct Ceiling and lighting patterns. While the discussion pods carry their respective light barrels, the café carries a stagger of light and HVAC flutes. 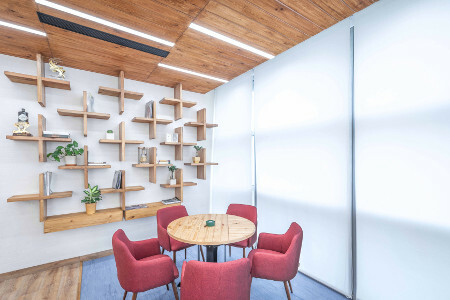 We believe in minimizing the use of materials and textures, hence the ceiling draws the same texture as the furniture or the walls. 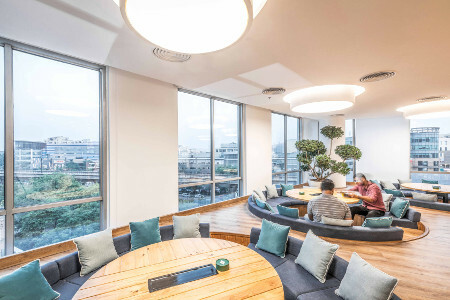 Owing to the profile of the 2200 sq ft Space, the office was divided into 2 zones – 1. Meeting Hall and 2. Café. The design of the Meeting Hall questioned the need for secluded meeting rooms. We proposed sunken discussion pods, each housing 14 seats. The Pods are self-sufficient to run individual discussions and presentations. These were sunk within the congregational amphitheater. The Meeting hall has the capacity to bring together 80+ proud employees. 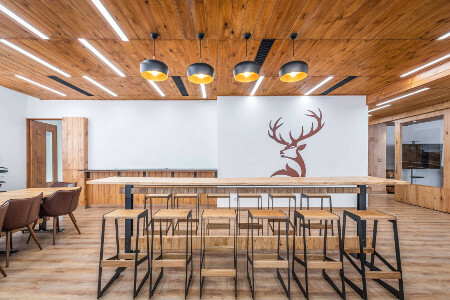 The café incorporates various configurations of seating – from coffee sets, to hot desks and even a 12’ long bar table. This encourages the user to seek individual comfort based on the hierarchy of conversation. 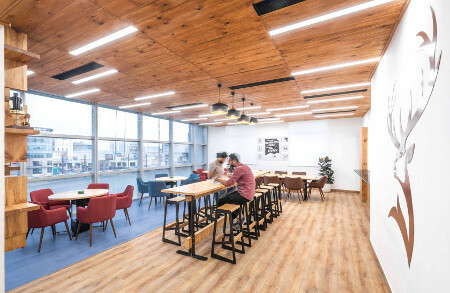 Unusual or 'Unconventional' is the word I would prefer for our Ideation Space as the space is not a typical office space with isolated ancillary subdivisions rather it is a meticulously articulated space which enhances individual and group discussions in an unprecedented manner. Examining the need for secluded meeting rooms in an office space. Interior Contractor: Dnova Infracon Pvt. Ltd.
MEP Consultants: Ambience Airtech Pvt. Ltd.